All of my work is made completely by hand. I begin with sheet metal or wire that I hand form, pierce, solder, patina, set and enamel. The images below display the processes of how some of my work is made. An example of piercing brass with jeweler's shears- the beginning step in the making of a pair of brass earrings. Heating the brass with a jeweler's torch. To reticulate brass, it is heated almost to the point of melting. This treatment changes the metal from flat and smooth to textured and irregular. Preparing to solder silver wire onto the brass- which will become the ear wires. 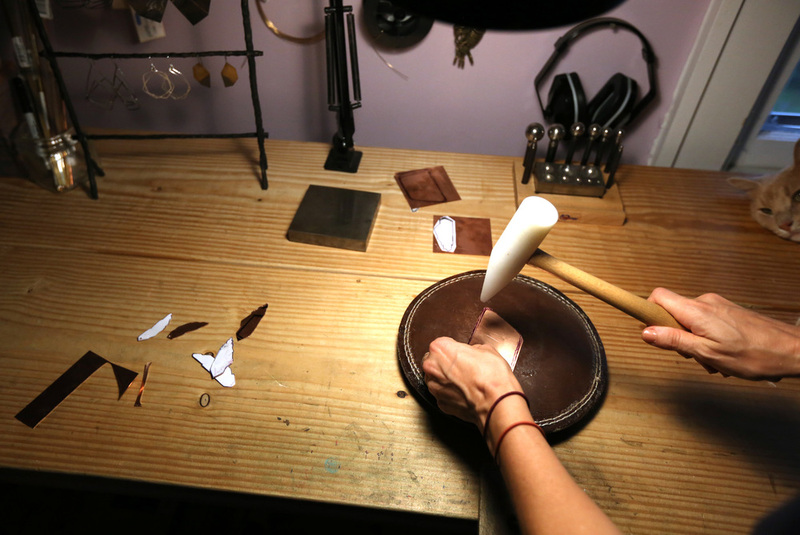 The beginning step of an enameled pendant- piercing copper sheet with a jeweler's saw. Forming the copper with a plastic mallet on a sandbag. It is then placed in a kiln and heated to 1500 degrees fahrenheit. After the piece cools, it is cleaned and coated with enamel on the other side. Hot out of the kiln. A few pieces after they have cooled- ready to become necklace pendants.